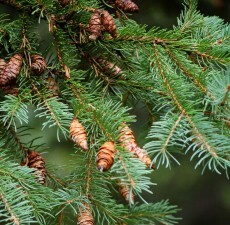 Aromatic Scent: Spruce Black Essential Oil is one of Canada’s best kept secrets. It is sweeter, and softer than most evergreen oils with a balsamic, resinous odor with green woody notes. Overall, the scent is very clean, fresh and pleasant. Cautions: Dilute in Carrier Oil before use on skin. Generally Safe for Use Topically and by Inhalation for All Ages. Avoid Use with Dogs and Cats. Avoid Contact with Eyes. Picea mariana / SD-O / Needles/Twigs / Canada Botanical Name: Picea mariana All of our Organic Essential Oils are NOP/USDA certified which means you can rely on receiving truly Certified Organic Essential Oils. They are 100% pure and natural and are free of herbicidal residue, pesticides and synthetic fertilizers. Main Constituents: α-pinene: 20.1 Bornyl Acetate : 19.7% Plant Part: Needles / Twigs Farming Practice: Organic Origin: Canada Processing Method: Steam Distilled Description: Spruce Black is a naturally growing tree in Canada. It is typically found in wet, swampy areas where the wild growing trees can grow up to 15 meters in height. Color: Colorless to pale yellow liquid. Common Uses: Spruce Black Essential Oil has a very pleasant scent, and can be used by aromatherapists to provide a sense of relaxation to the clients by using the oil in a warm bath. Consumers will also see Spruce Black oil frequently used in room sprays and detergents. Consistency: Thin Note: Top Strength of Aroma: Medium Blends well with: Pine, Cedarwood, Galbanum, Benzoin, Lavender and Rosemary. Aromatic Scent: Spruce Black Essential Oil is one of Canada’s best kept secrets. It is sweeter, and softer than most evergreen oils with a balsamic, resinous odor with green woody notes. Overall, the scent is very clean, fresh and pleasant. History: Spruce Black Essential Oil has a long history of use in saunas, steam baths, and as an additive to baths and massage products in spas because it energizes the senses through its fresh and pleasant aroma. Cautions: Dilute in Carrier Oil before use on skin. Generally Safe for Use Topically and by Inhalation for All Ages. Avoid Use with Dogs and Cats. Avoid Contact with Eyes.